If you have a good nonstick pan, then these flatbreads are easy to make, and good. They can be used in any recipe that calls for crepes or tortillas. Our family’s Sunday morning breakfast tradition is to have crepes or pancakes each week. They are delicious filled with fruit and cashew cream. They also work great as tortillas. And they are healthier and taste much better than storebought. To speed up cooking, I cook three crepes at a time, using two ten-inch T-Fal frying pans and one twelve-inch pan. Don’t be alarmed if your first crepes aren’t perfect. It’s a tradition to feed the first batch to the dog. 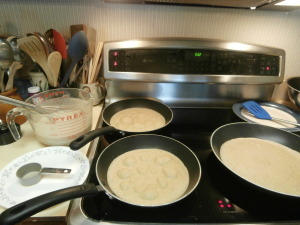 :) Once the pan is fully heated, the crepes come out much better. The batter tends to settle out very quickly, so it’s important to stir before every crepe. IMPORTANT: This recipe makes only about six crepes. You may want to multiply it to get the number that you need. Troubleshooting: If your crepes stick to the pan, check that the pan was preheated, that you included the oil in the batter, that the non-stick on the pan isn’t wearing out with old age. If a crepe won’t turn, let it cook for a few more minutes to see if it will release once it is fully cooked. Crepes or tortillas -- gluten-free, can be vegan. MUCH better than storebought! Preheat your frying pans on low heat. Mix all ingredients with a whisk, preferably in a mixing bowl with a pour spout. The batter should be about the consistency of heavy cream. If it is too thick, add a couple of tablespoons of water. Set out a saucer or small plate next to the bowl of batter. Turn up the heat under the empty pans to medium-high. Use a metal 1/4 cup measuring cup to stir the batter. Use the measuring cup to pour batter into a pan. Use 1/4 cup batter in a ten-inch pan, or a scant 1/2 cup batter in a twelve-inch pan. IMMEDIATELY tilt the pan so that the batter coats the flat bottom of the pan. Cook the crepe until it looks cooked through and the edges start to curl up a little bit. Use a silicone spatula to flip the crepe to cook the other side. Gently press down and rotate the crepe with the spatula. In a couple of minutes, use the spatula to remove the crepe to the plate. For the last crepe, you can use the spout on the bowl to pour the last batter. Storage tip: If you have leftovers, either store the tortillas flat, or fold each one individually, so that you can reheat it before unfolding it, because they stiffen in the refrigerator and then become supple again when reheated. The idea is to warm up the tortilla before you need to unfold it.